This salad is so addictive... we challenge you not to eat the whole thing in one sitting! 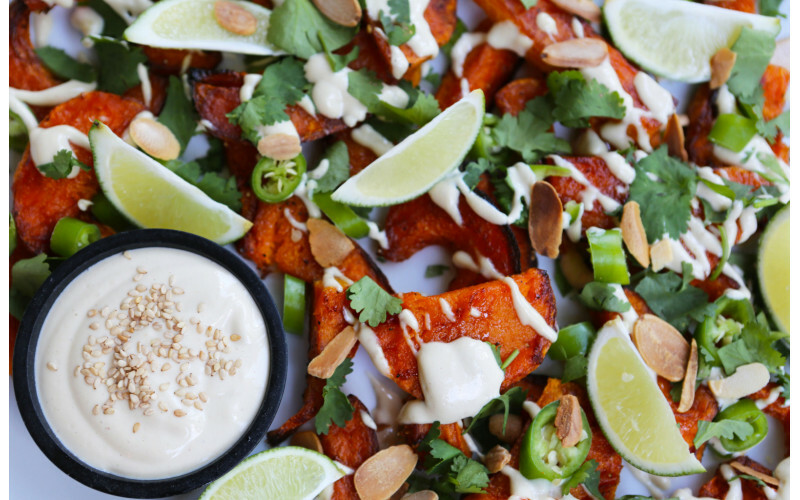 The sweet pumpkin or butternut squash combined with the tahini dressing and a hint of chilli is heavenly... enjoy! Peel the pumpkin or butternut squash (you can use a vegetable peeler if the skin isn't too tough) and cut into 1 inch thick slices or chunks. Coat in a thin layer of vegetable oil with a sprinkling of salt and place on a baking tray. Pop into the oven and roast for 40-60 minutes, or until nicely browned, turning once. To toast the almonds, pop them on a baking tray, with no oil, into the oven and check them after 5 minutes. They are ready when they are lightly golden and releasing a nice aroma. Arrange the slices on a plate with the lime segments, chilli, coriander, handful of flaked almonds and a good drizzle of tahini dressing. Blend all the ingredients together. Add more water if it needs to be thinned out or more tahini if it needs to be a bit thicker.